Nasco Life/form Fat Reduction in the Diet - A Prescription for Weight Control - Health Education Education Program - WA04240 by Life/form at Old Mill Middle North. MPN: WA04240. Hurry! Limited time offer. Offer valid only while supplies last. Nasco Life/form Fat Reduction in the Diet - A Prescription for Weight Control - Health Education Education Program - WA04240: By Betty Wedman-St.
Nasco Life/form Fat Reduction in the Diet - A Prescription for Weight Control - Health Education Education Program - WA04240: By Betty Wedman-St. Louis PhD RD LD. A comprehensive teaching guide including two lesson plans and three spirit masters provides background information and a general outline for the teacher. The spirit masters supply study guides recipes and meal plans. A grossly dramatic replica of 5 lbs. of human fat molded with the same techniques used to create Life/form food replicas is a shocking but strongly motivating attention getter. Made of soft pliable long lasting vinyl plastic the 5-lb. replica has a profound memorable effect when passed around among the audience. 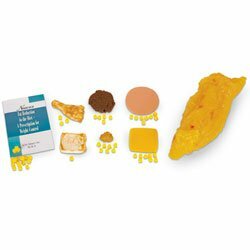 Control of fat in the diet is clearly demonstrated with the six Life/form food replicas included in the kit each with different fat content (includes haddock chicken leg beef patty peanut butter bologna and American cheese slice). Small yellow plastic cubes representing one gram of fat allow clear visual comparisons of fat content during lecture demonstrations or in static displays. If you have any questions about this product by Life/form, contact us by completing and submitting the form below. If you are looking for a specif part number, please include it with your message.